The April edition of Wood News Online is out and as usual it is packed full of the good stuff, starting with a brand new video product tour of the Sawstop Contractor Saw by Morton! We’ve also got a great new column by Steven Johnson, the Down to Earth Woodworker, where he contemplates a tough decision of parting with an old tool, builds a new stand for his miter saw (with your help!) and finds a great way to repurpose the old cushy floor tiles from his old shop. 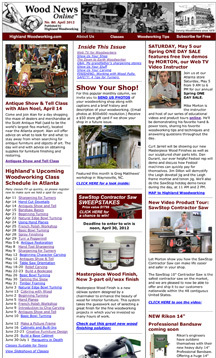 The Show Us Your Shop column features Greg Matthews’ beautiful North Carolina workshop, Paul Wee’s impressive carving makes up this month’s Show Us Your Carving column, and the Show Us Your Stuff column includes a wonderful story of three generation’s connection to the mighty chestnut tree. Check out all this and much more in this month’s issue of Wood News.